Mumbai: In the hearing about the strike by the resident doctors, Bombay HC is reported to have ordered Striking Doctors to resume their duties and give some time to Government to provide them proper security . Also, Orders have been given to government to provide ample security to all government hospitals so that Doctors can work properly without fear. Taking note of the complaint of doctors regarding mob like attendance with certain patients, the Bombay High court further ordered the government to make it mandatory that only 2 attendants would be allowed in the hospital with any patient. HC will gear the matter again after 15 days and access the situation and security provided by Government. Despite doctors being arrested earlier in the week, the Bombay HC has assured that no punitive action will be taken against protesting doctors once they resume their duties. Maharashtra Chief Minister Devendra Fadnavis had also requested that the doctors withdraw their strike with immediate effect, in the wake of the HC’s order. The minister has promised that strong punitive action shall be taken against those who attack doctors and the government will ensure the safety of doctors. Resident doctors on Strike informed Medical Dialogues team that they will take a decision after written court orders come. 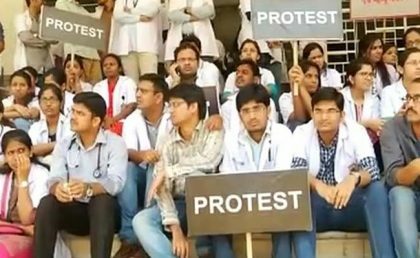 Currently 4000 resident doctors in Maharashtra and 40,000 members associated with IMA Maharashtra branch are on an indefinite strike on the issue of security at government hospitals. Judiciary is becoming activists by overreaching than being pragmatic. Court ordered docs to join under duress without ensuring their safety. This is not judicial verdict but activism. Sad. What is needed is revamping entire medical education and a quality of education has deteriorated drastically due to unmindful planning by inapt politicians. Entire healthcare delivery system should be nationalised but only if an able politician emerges out? Unfortunately independent India is still waiting for a leader who could give d country a right direction. Today international interference by other nations in weaker economies has increased to d extent that is unimaginable for various reasons. It is beyond d purview of discussion here. If discipline can be maintained in airports and railway stations, why not in hospitals? I recommend the judiciary and health administrators to make a personal but unannounced visit (by your emissary) to the Christian Medical College Hospital, Vellore, Tamil Nadu, where the morning outpatient attendance is over 8000. Everyone follows queue, no shouting is heard, help is always provided. People with uncontrolled and spontaneous rage cannot be predicted or prevented from presence, but they certainly can be prevented from doing harm. T Jacob John, Past President of Indian Academy of Pediatrics. Mr John, CMC Vellore is a minority institution and no Indian politician or public shall go to make hooliganism. Entire Western nations including Vatican shall come running in rescue of. This is sad saga of this country that is divided in so many parts by various reasons, like States, languages, religions, castes, and many other faultlines. Many other sensitive issues may better be left out from discussion here those have worst implications internationally. Promises made by Government seems to made for breaking .